Thinking of travelling Oz? Already booked? Not hella sure where to start? Well here’s the low to the down on my First week in Australia – With thanks to Intro Travel. It all started at Base Backpackers Sydney Hostel or shall I say home for the week (little did I know the place that would become home for quite some time) here I met the other Introers’ and the group leaders Ben & Dave. From here we went on a tour of the City’ where we was shown all the important places – like bottle shops. *Priorities* Then we settled at Hyde Park for a bit sat in a nice circle and sung kumbia, ok I’m lying. Instead we introduced ourselves by using our most embarrassing drunken story – (this is when I realised my groupies were raging alcoholics & that we would get along just perfectly) drunken chat out the way, we made our walk towards the Opera House’ it didn’t take long before we caught a glimpse and we all went a tad tourist cray cray & ran towards the Opera House for our all important selfies. Once we had gotten our all important selfies, we walked to Circular Quay where we was going Jet Boating! Perfect to beat that Jet Lag, if you have just landed like me! 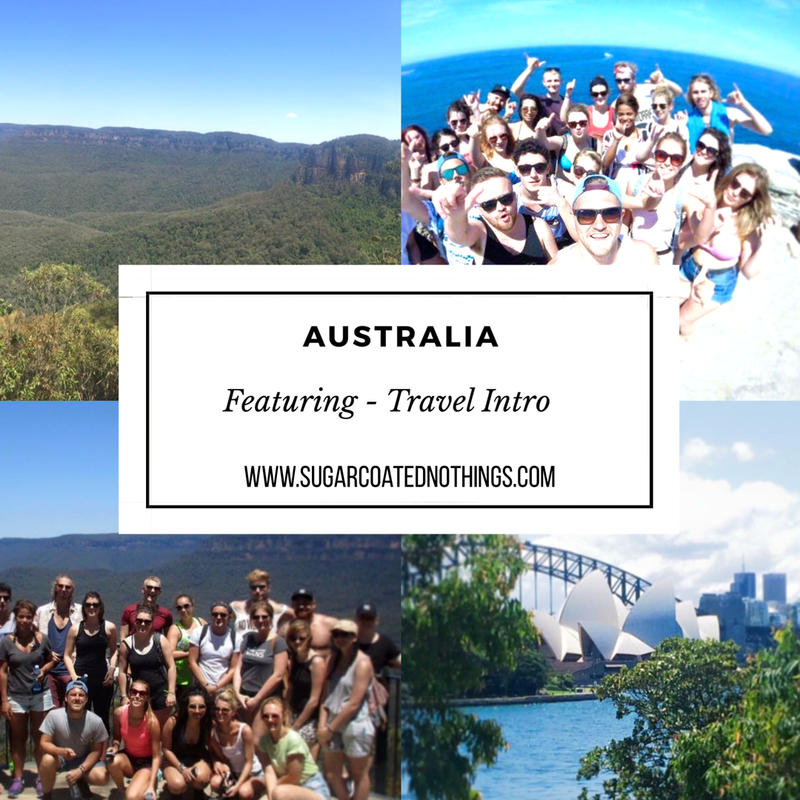 It was such a laugh, and defiantly a perfect way to break the ice on your Australia Travels! Surf day! I won’t lie – I did not enjoy the surfing (totally has nothing to do with the fact, I cannot surf and freak out everytime something in the sea touches me) – but it was still probably one of the funniest days I have ever had. There’s something humerous about watching people so desperately trying to surf…… defiantly worth the experience! After getting over the events of surfing – that night we all went out for a much needed bevvy – we was taken to “side bar” – which is a bar attached to another Hostel. They had a really cool bar , and cheap drink (all that matters eh!) – I don’t really remember much, so I think it was a good night! Bank day/ Aquarium Day! – We was taken to the Bank to sort out our Bank Accounts and get our Bank Cards! Didn’t take long and was glad it was sorted! Bondi to Clovelly day! We went to Bondi Beach, where we chilled and soaked up some sun for a bit! Also, took some all important Instagram pics with the cool street art graffitti along the walls. Once we finalllyyy arrived, we had a barbi on the go waiting for us! And that’s when I felt like I was in OZ! (A barbie on the beach! Status quo, I know) – then we had alcohol (yay) – and played some volleyball, and had music going on the speakers. Was a really chilled, cool day. Which ended with a nice Tan & a typysy me! 8am start, as it was Blue Moutains day! But en route, we was taken for a suprise (you guys!) – we pulled up at Featherdale Wildlife Park where we got our tourist on’ , stroked and fed some kangaroos, and had an all important selfie with a Koala! After here, we headed on to the Blue Moutains – it was a hella’ lot of walking (jesus help me) in 40+ degree heat – but the views were unreal! The stairs are super steap, so if your a p*ssy like me – you will find yourself turning around and heading back! I am still super regretting not going all the way, but I am wooss. We also found a cool waterfall, and obvs I was sweaty betty so was straight in there! We also met a guide, who told us all about the Blue Moutains and some of its history! Today, we all got time each to decide and go through what we wanted to do when the week was over! We got info about work etc, and things we would need! And also got the chance to book our East Coast Trip, which I ended up having booked by the end of that day! Evening time was a Pub Crawl, that we as a group was put in charge of deciding the fancy dress theme! We was really typical and went for the “Bay Watch Theme” – on a backpackers budget…. again, wine was involved so the night was a bit of a blur. The final Intro Travel day! Had a chilled day (accompanied by a hangover) and then that evening we went for a Farewell Dinner at the Westfield Tower – buffet dinner, (wineee) and great company! Intro Travel week was over! But the travel journey was just begining – click here to read all about the East Coast! Why would I recommend Intro Travel? Like me, if your going travelling for the first time completely blind and alone – it is a great way of making friends from the get go! Also, your travel is booked for the week, you have people there to help you with anything – so it takes the pressures and anxiety off of you and allows you time to settle in! Was Intro Travel good value for money? Yes! I was actually really suprised the amount of things that we did get, from lunches, the excursions and your accomodation for the week! Not to mention, the help with work, booking the East Coast, your bank account etc! 100% worth it. Anything last words on Intro Travel? It is 100% worth doing. I met amazing friends, who I still regularly see now. Once your week is up, they don’t just wave you off – they are always on hand and around to help you with anything – throughout your stay in Australia! So if your debating going to OZ, what you waiting for? You will have the time of your life! If you have anymore questions, please fill out the form below and I will get back to you ASAP. To contact/book Intro Travel check out their website and Facebook now!